With few big name players getting hit by the injury bug this weekend and the bye weeks a thing of the past, the waiver wire cupboard suddenly seems quite bare. Most teams should have their starters set for the final playoff push, but for those less fortunate, there does happen to be some names that you may want to invest in for the final few weeks of the regular season. And who knows? Maybe one of these guys could end up being the surprise fantasy playoff MVP of 2010. Here are a look at a few players you may find on your league’s waiver wire that could prove to be serviceable down the stretch. Reggie Bush, RB, NO – There is a good chance that Reggie Bush is already sitting on someone’s bench, but after getting injured in week 2, there is also the chance that he may have been dropped by an impatient owner, and is still laying around in your league’s free agent pool. If so, pick him up immediately!!! Bush may take a game, or two, to get back into the groove, but come playoff time, if you have the opportunity to use him, you will be glad you had him as the Saints offense continues to roll. Mario Manningham, WR, NYG – Is your team in need of a receiver that can be injected immediately into your starting line-up? If so, you may want to check if Mario Manningham is still available. In less than two weeks, he has gone from number-three on the Giants’ depth-chart to number-one , thanks to injuries to both Steve Smith and Hakeem Nicks. New York plays the Jaguars weak pass defense in week 12, so you can expect Manningham to produce some solid point totals right away. Derek Hagan, WR, NYG – If you can’t get Manningham, you may want to roll the dice with Hagan. While he may not be the long-term solution to your team’s wide receiver problems, he could be a big help in week 12. The Giants will continue to throw the ball with Eli Manning under center, and in the number-two role, Hagan could put up some decent stats against the Jaguars. Nate Burleson, WR, DET – Although Calvin Johnson gets all the attention in Detroit, Nate Burleson has quietly been putting up some strong numbers over the past few weeks. In fact, since he returned from a two-game absence in week 5, he has recorded a touchdown in four of six games. Through those six games, he also has 35 receptions and 410 yards. If the rest of your league is still sleeping on Burleson, don’t follow suit. Joel Dreessen, TE, HOU – Last year Owen Daniels was having himself a strong year before suffering a season-ending injury. 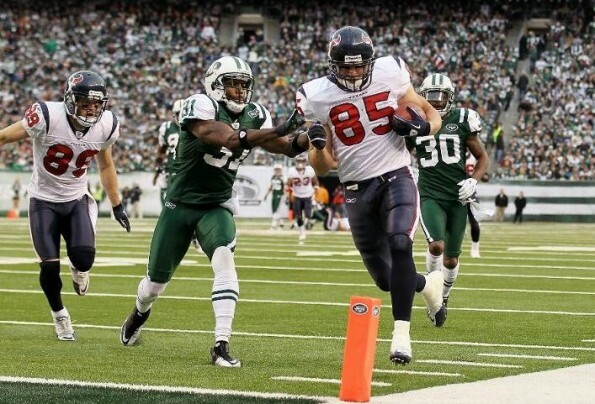 Since then, the Texans have been looking for an answer at the tight end position. Although it seemed like Daniels would eventually be the man at some point, he hasn’t been able to shake the injury bug. That may have opened up the door for Joel Dreessen, who is coming off a stellar performance against the Jets that saw him record 106 yards and a touchdown. During a time when productive fantasy tight ends appear to be a dying breed, Dreessen could turn out to be the answer to a problem shared by many teams.